My names Josie and i'm new to this wonderful forum, which gives out lots of help and advice. Luli Mei is my first bengal and hopefully not the first. I also have a Siamese Kia and she's 8yrs and Oriental Bella she's 9-10yrs. 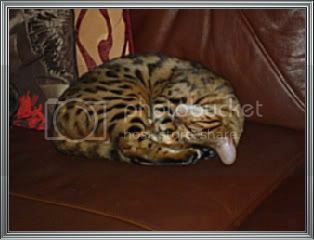 Luli has settled in great, just abit of hissing at first with my 2 other cats, but after 2-3 days its been very good. Luli now chases the other cats which is good in a way as the older cats need a bit of exercise, being indoor cats and age they have gone a little fat...lol. Luli is 16 weeks haven't yet received reg papers, not sure when i will get them, does anyone know around when i should receive them? I had Luli from Starwinds Bengals. Adrianne's cats are so adorable with such good calm characters. Thank You Adrianne for giving me such a wonderful kitten. 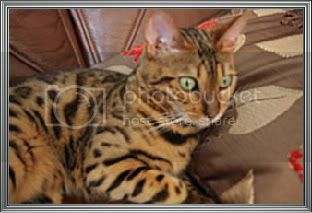 I am hoping to show her in the future and i'm looking forward to meeting other bengal cat owners. There's never a dull moment when you have a bengal about. Luli has already put her stamp around our home with plenty of joy and laughter. Hi and welcome to the forum - sounds like you've got a wonderful mixture of cats in your household. Your contract might say when you'll get the papers - often it's not until you confirm that you've had the kitten neutered at around 5-6 months. Can't wait to see pictures of your feline family - there are some instructions in a stickie in the Gallery forum. They're for Tinypic but it's much the same with Photobucket. You'll need to set up an account (they're free), then upload your pictures to the hosting site and then copy and paste the IMG code into your message on here. Then the picture will show up. I bought Luli Mei as a show/breeding kitten, so i hope she will do well in showing, never shown before it will be a very new experience for me. I use to breed siamese and orientals years ago. I have been on this computer working out how to put pics on it6s taken me ages so this is what i have. Hi Josie a very warm welcome to you and Lulu Mei! Hello and a warm welcome to you Josie! Welcome, she has a beautiful name!